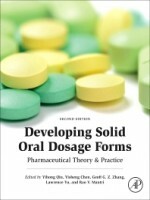 The second edition of Developing Solid Oral Dosage Forms illustrates how to develop high-quality, safe and effective pharmaceutical products by discussing the latest techniques, tools and scientific advances in preformulation investigation, formulation and process design, characterization and scale-up and production operations. This book continues to cover the essential principles of physical pharmacy, biopharmaceutics and industrial pharmacy and their application to the research and development process of oral dosage forms. Chapters have been added, combined, deleted, and completely revised as necessary to produce a comprehensive, well-organized and valuable reference for industry professionals and academics engaged in all aspects of the development process. New and important topics include spray drying, amorphous solid dispersion using hot-melt extrusion, modelling and simulation, bioequivalence of complex modified-released dosage forms, biowaivers and much more.